A new pop-up venue for arts, sports and culture by Stomping Grounds Collective has been announced for Canberra’s west side, a multi-purpose inner city space that uses shipping containers as its core element. The ‘Westside @ Acton Park’ is designed by Cox Architecture and Murtagh Bond Engineers for a 20 by 40 metre futsal slab approximately 100 metres from the water’s edge. 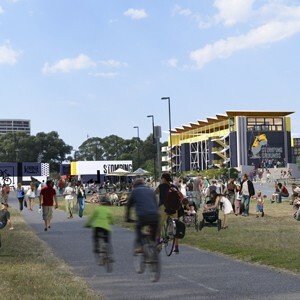 A part of the ACT Government’s broader urban renewal plans to better connect Canberra’s CBD to Lake Burley Griffin, the project seeks to get residents to experience the waterfront before further developments begin. A mixed-mode ‘micro square’ has been designed for the site, which will be framed with activities ranging from cultural, arts, and sports events, to cafes, bars, restaurants and digital retail incubation. An in-house media centre is also in the works, and will assist in developing content for the precinct’s digital screen. Steering away from the traditional stereotype of a “quiet, clean and tidy Canberra”, designer and Cox associate Ronan Moss says the design of the space will be “real” and “grungy”. “This starts with our use of shipping containers as the core element – allowing for flexibility of design and use, economy, and for us to create dynamic spaces which can be easily and rapidly disassembled and rebuilt in multiple locations around Canberra,” he explains. The shipping containers, which stack up as a cost-effective building module, will contain programs such as cafes and retail. Tenants will fit out their own spaces to suit their needs. A steel structure will then be built around these containers, and which will be erected in just three weeks. The materials will be pre-fabricated off-site, with no traditional trades expected to go through it during construction. The team will also utilise other readymade or recycled materials and objects to create the spaces, including tubular steel and modular flooring and roofing panels. ‘Meccano-like’, Westside will appear in coming weeks as a pre-fabricated pop-up structure. Stage one, to be known as ‘the lookout’, will be ready for Floriade 2014 in September. Stage two will be a ‘village hub’ (court), and stage three a ‘lakeside hub’.